I had a wonderful opportunity to visit the Seaboard Railroad Station in Suffolk, Virginia recently following its 125th year Anniversary celebration. I thought this station, which is now known as the Seaboard Station Railroad Museum, might be of interest to other model railroaders particularly since it contains a large, realistically detailed HO model railroad taking up two large rooms within the museum. The model depicts the station and the surrounding area during the early decades of the 20th century when it was most active. The Seaboard Station is no longer active, although it has several CSX trains that run behind it every day, which is a thrill to watch from the vantage point of the small observation room upstairs. In its heyday, it would have as many as 100 trains run through the tracks on both sides of the station! Usually the Seaboard line would run on the rails in front and the Virginian would run along the tracks behind the station. Four other lines used the station as well, including Norfolk and Western’s passenger trains, the Powhatan Arrow and the Pocahontas. 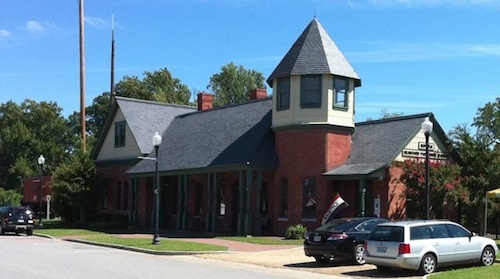 The Suffolk-Nansemond Historical Society has restored the station to its original glory of 1885. The model railroad housed within was planned, designed and built by the Tidewater Branch of the Mid-Eastern Division of the NMRA (National Model Railroad Association). It took about 2 years and many man-hours to complete, but it was well worth the effort. There are many interesting and sometimes-humorous details if you look closely. The essence of the era and the locale has been captured with significant grace and beauty. Not only is the scenery beautiful, it operates like a dream! 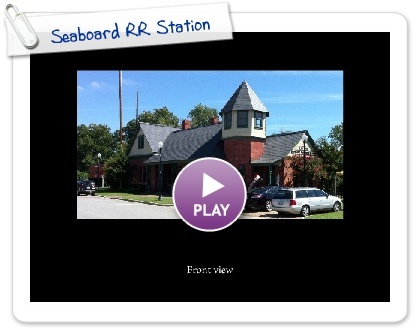 From "Seaboard Railroad Station" to "Showcase"
From "Seaboard Railroad Station" to "HomePage"